I am delighted to display a specially commissioned drawing by Sarah, an immensely talented artist, to introduce this latest interview series. 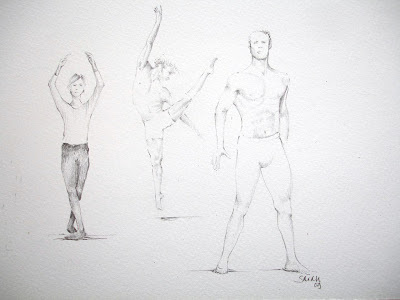 Sarah’s brief was to depict the dancers’ progression from student to professional, and the resulting sketch perfectly represents that transition. 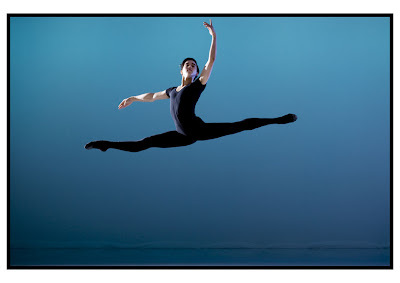 Benjamin Ella, a Graduate of The Royal Ballet School, has accepted a contract with the Company and begins work as an Artist in the Autumn. 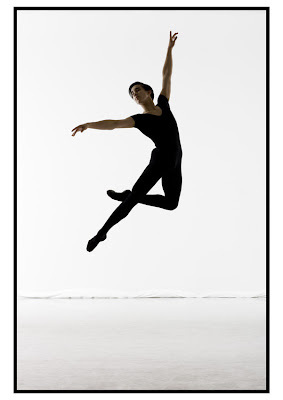 I'm looking forward to finally becoming a professional dancer and to have the opportunity to learn and perform the Royal Ballet's wide range of fantastic repertoire. I'm excited about forging my career with the Royal Ballet. Firstly, it's going to be great not having to wear the same uniform every day! However, there are many luxuries as a student which I will miss such as having so much done for you and having the time to just concentrate on training. Well, graduating with Honours and sharing the Most Outstanding Graduate award with my friend Vadim Muntagirov was a great finish to my three years at the Royal Ballet School. Also winning the 2nd prize and the Mary Day artistic award at the Youth America Grand Prix in 2008 was a highlight. There have been others but for me personally, having been given the opportunity to tour so often (9 times) usually with a group of dancers that have become some of my closest friends and to so many different countries during my three years has been incredible. There are so many that it makes it difficult for me to list all of them! However, I would say Carlos Acosta, Mikhail Baryshnikov, Vladimir Vasiliev and Tetsuya Kumakawa have been some of my top idols that have had a lot of influence on me as a dancer. 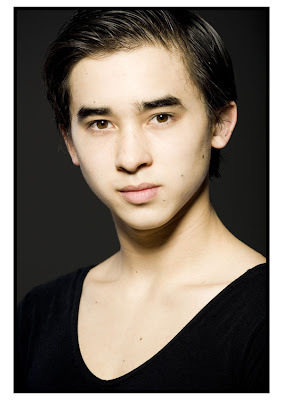 There are also many young, up and coming dancers that I admire and learn from. That's a tough one! I guess at this stage I really don't know but I am extremely eager to learn and perform many different ballets so I hope to contribute to this already great company my passion for performing. I already know quite a few members of the company thankfully, so it won't be too daunting. However, unfortunately I have been on crutches for over a month with a stress fracture in my foot and am slowly recovering now, which means I will not be dancing fully when I start with the company. I hope to recover well and soon. I don't have a particular favourite role but there are definitely several that I would love to dance such as Romeo, Siegfried, Albrecht, Solor and maybe even Basilio (although Royal Ballet haven't done Don Quixote for a long time.). But there are many ballets I am not very familiar with including some of the shorter and possibly not so well known works that no doubt I would be interested in. Don't waste a moment of your last year as a student because you never know when opportunities will come up. Also don't be complacent with looking for a job. 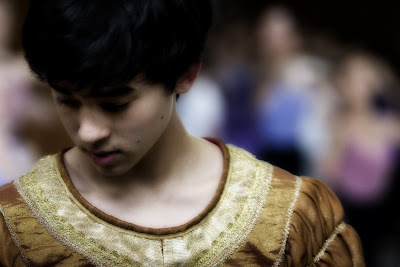 I would hope to be well established with a good reputation in the company and be looking forward to some bigger and more demanding roles in the 2nd season. I really love watching young talents grow up and to follow their career. Great interview, thanks! Benjamin, I wish you a glorious start and get well soon! What a fantastic interview - you've really asked some clever questions and I love your writing style. Thank you for this superb interview - one of many ! Such a clever boy ! I must say how much I like the drawing at the top of your interviews. There is a lot of depth and I really get the idea. Ben will go far; he has enormous talent and I'm hopeful that he will get the opportunities professionally that he has received as a student. I'm sure he'll work hard for them too. Thank you for bringing this interview to me - I'd have known nothing of him otherwise. Thank you to everyone for your comments and I'm very pleased that you enjoy reading about these wonderful dancers. What a fascinating blog! I love your "cupcakes and conversation posts. This is absolutely beautiful and touching!! You may think me sappy, but i became a bit verclept at the progression picture. I really admire people that follow through on their dreams and pursue them with such unwavering dedication and determination.... thank you for inspiring me!! !